If your square isn’t there, it means it’s in the pile that I either haven’t bordered yet, or haven’t sewn in! I’ve had some lovely contributions recently (check out the Masterpiece page) and I know that there are squares coming soon from Canada, Australia, Ludlow and Aberystwyth… it sure is a cosmopolitan creation! I’m also working on a Pinterest board for the project, which you can check out here; but remember, it is a work in progress. I’m planning to accept contributions until about Easter… hopefully you will have beaten the afghan into submission by then! It’s looking amazing, and I’ve been taking a look at the Pinterest board as well. You’re going to need a ‘map’ of the Masterpiece when it’s done, to explain the ideas, sources, materials, etc. I was going to put a whole load of stuff on Pinterest yesterday, but was unable to access it because of some technical issue and then today I got focused on sewing! To some effect, I might say! 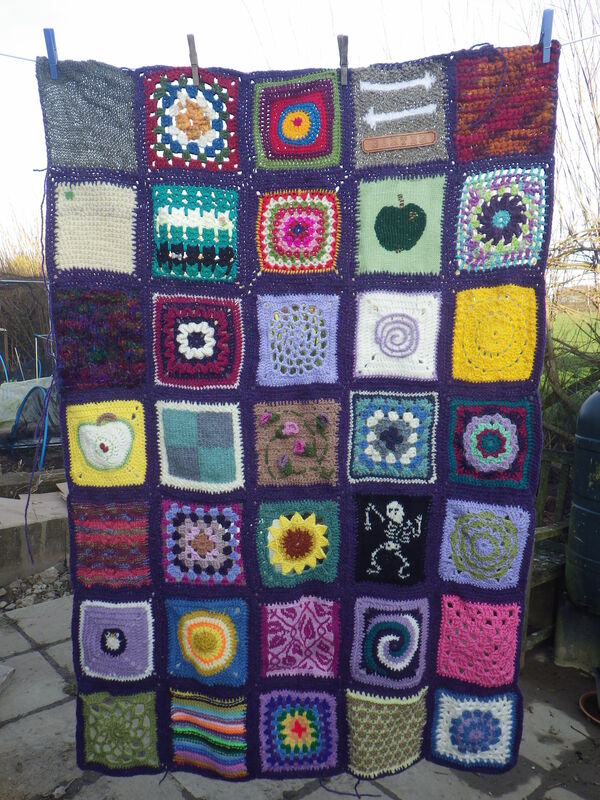 It’s looking wonderful, and all those very different squares are playing very nicely together. Good to know Easter is the deadline, but since it’s rainy here today I think I’ll sit and embellish the already-knitted square I’ve done so I can get it away to you before the last minute. Oooh, lovely – thank you! Stunning. Congratulations on getting to Pinterest. I’m still not sure how to make the most of Pinterest, but I like the fact that I can use it to store ideas. That is already stunning. I can see some gorgeous squares there ..apples and flowers. It is coming together beautifully. WOW! This is truely a labour of love, mostly from you, of course, but also from so many other people. 🙂 how big will it be when you have finished? I keep getting offers of squares, so I think that in the end it will be 9 rows by 7 columns (it’s currently 7 by 5) which would make it about 160x125cm before I’ve done the final border… but it may be bigger because I already have lots of squares that are not stitched in yet and I know of quite a few more on the way. At this rate it will be big enough to cover your house! Thank you – I edged your squares just last night. Oh I am enjoying your project. I love seeing the different squares. Tell your friend Linda her square is perfect! I will direct Linda to this comment! Thanks for sharing… nice to be inspiring!